Stand-out style, durability and functionality, the upscale Hartford Collection round picnic tables are an ideal solution for creating inspired seating and dining spaces. Expertly designed for comfort and enjoyment featuring 36" solid table tops with curved bench seats that are easily accessible and ready to accommodate up to 6 adults. 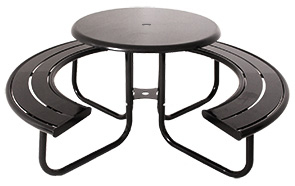 Engineered with MIG welded, all-steel construction with round tube frame with an ultra-resilient powder-coated finish that protects against rust, fading and corrosion—ensuring the picnic tables maintain their original upscale form throughout the years.